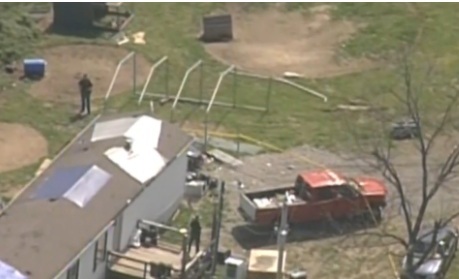 Ohio AG: Executions were "old-fashioned, calculated massacre"
PIKETON, Ohio-- Ohio's attorney general toured the four homes where eight people from one family were shot dead in a rural part of the state. Attorney General Mike DeWine said at a press conference Wednesday he expects the investigation into the murders of seven adults and a 16-year-old boy to be lengthy. The victims were found dead Friday at four properties in the hills near Piketon. Investigators haven't made arrests or confirmed a specific motive for the slayings. "This was an old-fashioned, calculated massacre of eight human beings," DeWine said. A coroner says seven of the eight victims were shot multiple times, and one had nine gunshot wounds. Some victims also had bruising. DeWine was in a group of law enforcement vehicles that headed up a winding road toward some of the properties Wednesday morning. He had been at the scenes last week, but DeWine said the scenes were still being processed at the time. Pike County Sheriff Charlie Reader said investigators are still combing the scenes for evidence. "This is something that's going to take a while. It's absolutely shocking, some of these scenes," Reader said. "It's not one where you can simply go in, process, collect all the evidence and then go away." After the slayings, DeWine warned that there was an "armed and dangerous" shooter or shooters still on the loose. Officials urged the community to use caution, especially other members of the targeted family, which they identified as the Rhodens. Did Mexican drug cartel carry out Ohio family murders? The state crime lab is examining nearly 80 pieces of possible evidence recovered from the scenes, according to WBNS. Investigators have interviewed more than 60 people, CBS News confirmed. Investigators also spoke with an Ohio man named Rusty Mongold, apparently about a Facebook post that appeared to threaten the youngest murder victim, 16-year-old Christopher Rhoden Jr.
A law enforcement source confirmed to CBS News that investigators found some 200 marijuana plants inside an indoor grow operation found in some of the homes where the shootings took place. The size of the operation, according to the source, indicates the marijuana was being grown for sale and not for personal use. DeWine couldn't say with certainty whether that may have been a factor into the murders. Investigators are also looking at the possibility a Mexican drug cartel is behind the pre-planned execution of the family. At Wednesday's press conference, DeWine and Reader declined to comment on whether police have narrowed down a motive or set of suspects in the crimes. "I assume that the person or people who committed these murders are watching the news reports that are coming out of Pike County," DeWine said. "I do not intend, I do not want to broadcast any information that would be helpful to them." Tony Rhoden tells The Columbus Dispatch that his 73-year-old mother has been holding the grieving family together. Rhoden lost two brothers, his former sister-in-law and a cousin in the slayings. He says the victims also included a teenage nephew who had just earned a driver's license, a 19-year-old niece who worked at a nursing home and had a days-old newborn, and a 20-year-old nephew who loved to hunt and fish. He said five of the victims will be buried side by side in a nearby town.